Obama in Alaska: Petrostate politics help explain mixed climate change policy. 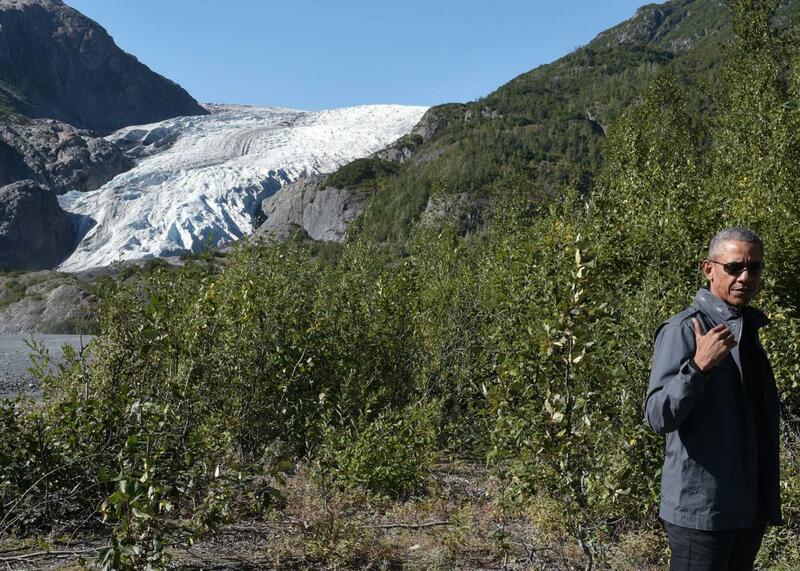 Obama near the Exit Glacier on Tuesday in Seward, Alaska. But his words—as powerful and compelling as they are—fall flat, given his record of expanding domestic production of fossil fuels. Lost in the debate over Arctic drilling is the fact that the administration has quietly set in motion a vast expansion of coal mining in Wyoming that could erase the cumulative impact of all his climate policies—three times over. The United States, now planet Earth’s second biggest producer of fossil fuels behind only China, increasingly functions as a petrostate. Some have argued that this is a good thing—better to bring all that coal, oil, and gas out of the ground in a democracy that can apply environmental oversight. But it sends dangerous mixed messages to other countries that are considering whether to increase the ambition of their own climate policies. Since the U.S. has long held a ban on oil exports, the crude we used to buy on the global market is now up for sale elsewhere, and prices have plummeted in response—counterintuitively strengthening the American oil industry. Lawmakers in Alaska, which derives about three-quarters of its tax revenue from oil and gas, are practically begging Obama to keep the tap flowing. Obama mentioned none of this in his speech on Monday. Climate Obama is perfectly happy making grand speeches while Oil Baron Obama gleefully counts the money flowing in from industry. Behind the scenes, senior administration officials have acknowledged that they are trying to have it both ways. The public is smarter than this. Americans—even Republicans—now overwhelmingly support action on climate. The president has little to lose, except the goodwill of the oil industry, by taking a harder stand. Nearly every seemingly insurmountable fight in American history—slavery, civil rights, gay marriage—required an engaged and activist public to galvanize bold change. The fight to stop climate change is no different. It demands personal sacrifice, which I think Americans are willing to provide, within reason, if they see their leaders taking a tough stand.